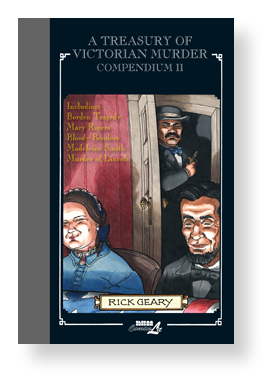 Coming in December is the second volume of Rick Geary’s A Treasury of Victorian Murder Compendium. Following the success of the first Compendium, the second volume will have almost double the content. The quarter-bound hardcover will feature 400 pages of real murder cases from the Victorian era, 5 complete stories! First is the tale of The Borden Tragedy where “Lizzie Borden took an axe, gave her mother forty whacks, when she saw what she had done, she gave her father forty-one!” It was recently turned into a movie starring Christina Ricci. “Geary returns with another typically superlative work…Artfully precise reconstruction…A delight!” Publishers Weekly starred review. The Murder of Abraham Lincoln looks at the most famous assassination of the Victorian era. Geary talks about the sinister plot, the gruesome murder, and the aftermath of the presidential murder. This new collection will be available starting in December. Order now through Diamond Previews or at your local comic book store. A Treasury of Victorian Murder Compendium I is available now. For more by Mr Geary, see his NBM Author Page. Next Next post: NBM is going APE!